A showcase production of Made to Dance in Burning Buildings played to a sold out house at Joe's Pub at The Public Theater on April 24, 2018. The World Premiere of Made to Dance in Burning Buildings recently closed its successful five-week run (Feb. 15-Mar. 16, 2019) at Shaking the Tree Theatre in Portland, Oregon. Made to Dance in Burning Buildings is a fusion of poetry, theatre, and violent and visceral contemporary dance which poses the question: HOW DO WE HEAL FROM TRAUMA? It's about Ava, a young black woman, who is raped by her boyfriend's friends while he watches; she develops PTSD as a result. Metaphorically, she fractures into five different women who each represent a different facet of her personality (Romance, Despair, Madness, Perseverance, and Missing You). 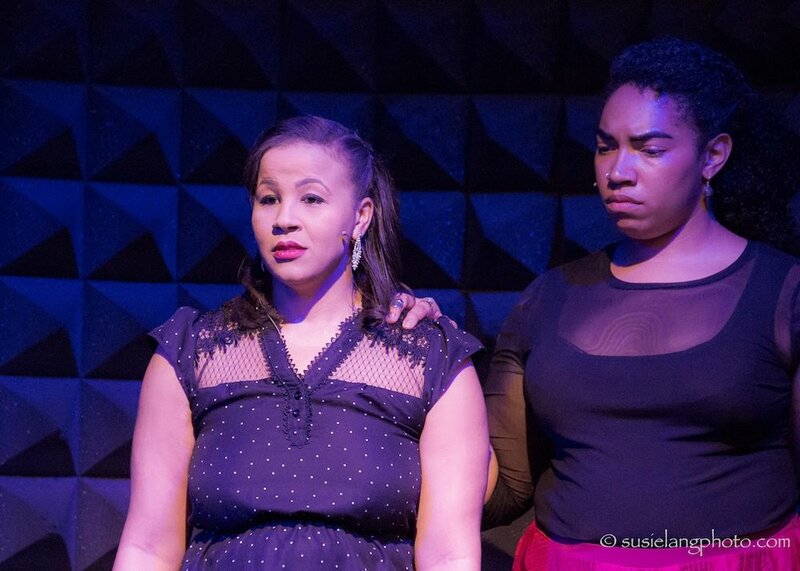 Poetically, these women narrate her journey through PTSD while she, her first love, and her abusers explore through dance the trauma and the events leading up to it. Amber Bates as Ava and Jeff George as First Love in the Shaking the Tree Production of Made to Dance in Burning Buildings, 2019. Photo: Gary Norman. “The most powerful expression of trauma I’ve ever seen. Courageous and intense, Made to Dance in Burning Buildings gives audiences a unique opportunity to witness precisely what it means to be a Survivor. To see this production is to see Us. Congratulations to Anya, cast, and crew, on an astonishing show." Anya Pearson and Aleca Piper. Showcase Production of Made to Dance in Burning Buildings, Joe’s Pub at The Public Theater, April 2018. Photo by Susie Lang. Find out about Anya's projects. Anya Pearson (back), Kayla Banks (middle), and Tammy Jo Wilson (seated). Above a Whisper, SALT, Shaking the Tree. May 2018. Photo: Meg Nanna. Interested in helping out? Share about Anya's projects on social media, make a tax-deductible donation to Anya's production company Urban Haiku, volunteer, get involved.